Need some help with stress? Learn to increase your awareness so that you can pay attention to things as they are rather than to how you wish them to be. Instead of spending a lot of time being caught up in concerns about the past and worries about the future, Mindfulness helps you to keep grounded in what’s happening now. In any situation, how you think (cognitive thinking) influences how you feel and what you do in response. When you experience distress, the way you respond with your thoughts, feelings and behaviour, can intensify our problems. You may feel stuck in certain patterns. Mindfulness can help you to have an understanding of your responses to stress, and how they have developed. It can also help you develop more appropriate responses. What problems does Mindfulness help with? In an 8 week Mindfulness course you will learn to deal more skilfully with the stresses and strains of daily living. You will learn to become more familiar with the workings of your own mind patterns and habits. This helps you plan for how best to respond in stressful situations, rather than react in our old familiar, often unhelpful ways. You will learn to increase your awareness so that you can pay attention to things as they are rather than to how you wish them to be. We often spend a lot of time being caught up in concerns about the past and worries about the future. Mindfulness helps you to keep grounded in what’s happening now rather than being lost in your thoughts. 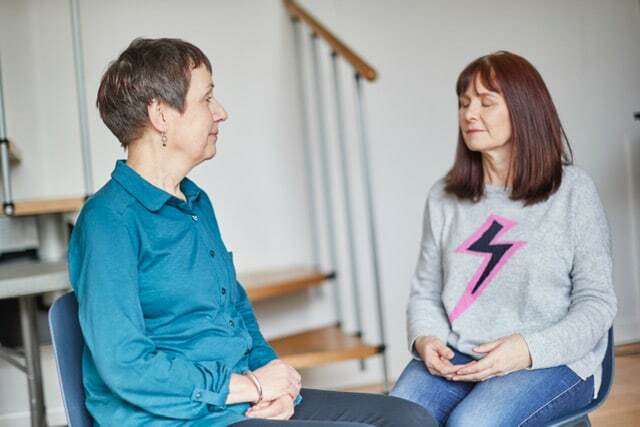 The course involves practising different types of mindfulness meditation and some discussion and teaching about the benefits but mostly it’s quite a practical course. Each participant gets a handout book and USB memory stick or CD of the guided practices for use at home and after the course. Call us to book your place. We are currently taking bookings for the April course in Rushden.